The Bureau of Engraving and Printing is now accepting orders for large, uncut currency sheets of Series 2013 $1 Federal Reserve notes. Printed on newer presses that use larger currency paper, the notes are available for the first time in a full sheet of 50 and in the smaller subject sizes of 5; 10; 20; or 25. The dollars were printed in Fort Worth for the Federal Reserve Bank of Dallas, and bear the signatures of Secretary of the Treasury Jacob Joseph "Jack" Lew and former Treasurer of the United States Rosa "Rosie" Gumataotao Rios. These sheets follow older, no longer available BEP products with Series 2009 $1 notes. Those featured the signatures of Rios and former U.S. Treasury Secretary Timothy Franz "Tim" Geithner, and came in smaller subject sizes of 4; 8; 16; and 32. Read about the differences between the 32-subject and 50-subject sheets. 50 subject sheet (Dallas) for $86.00. Each has respective premiums of $13.50, $17, $23, $25.50, and $36. The BEP does not charge for shipping. 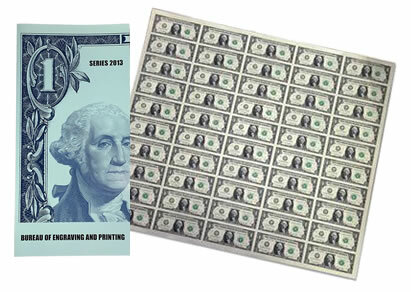 The new Series 2013 $1 Uncut Currency Sheets are available from the BEP online store at www.moneyfactorystore.gov/uncutcurrency.aspx, or by calling 800-456-3408. The BEP is the largest producer of security documents in the United States. It prints billions of Federal Reserve Notes each year for delivery to the Federal Reserve System. It also produces products for money collectors to include currency sheets, note collections, intaglio prints, vignettes, and presidential portraits. The BEP invested heavily in new, special printing presses made in Switzerland to achieve better production results at its two printing facilities in Washington, DC & Ft. Worth, Texas in recent years. The BEP & its sister bureau, the US Mint use mostly presses & other machinery made in Germany, Switzerland & the Netherlands. These uncut FRN sheets make great framed displays & some upscale boutiques have even offered the larger sheets as a gift wrap option for their designer products in past years. The public at large is mostly unaware that uncut sheets of notes have been available by mail order from the BEP since the early 1980s. A fun collectible! I order my $1 sheets this morning at first bell…..8am. And now this afternoon, they are OUT OF STOCK ALREADY !! These new, first day issue 50-note & 5-note $1 uncut sheets are also being sold today at the BEP booth at the largest annual numismatic show & convention in the world August 9-13 in Anaheim, California hosted by the American Numismatic Association. Many are being sold there. Glad I called at 7am CT to be one of first to order. I have bought many uncut sheets since the late 1980s & had them framed (some I got autographed by the US Treasurer at ANA shows) although this larger one will be expensive to frame!